Many people will become the primary caregiver of an aging parent or loved one, if they haven’t already. Caregiving is worthwhile and rewarding, but there are many challenges facing family caregivers. 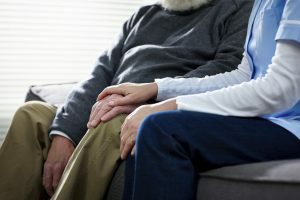 It becomes even more challenging if the caregiver has his or her own obligations, such as a job and children to care for, or if they must travel long distances to care for their elderly relative. Constant stress: Caregiving can be emotionally and physically demanding. Of course, you worry about your loved one and you want to make sure they are taken care of in every way possible. This worry alone can cause stress, anxiety and even exhaustion, which can all lead to health problems for you if they are not recognized and managed properly. Time management: Because caregiving can be a full-time job, caregivers often have less time for themselves, as well as their own spouse, children, friends and other family. Sometimes they spend so much time on their duties that they can’t enjoy other things like social activities, vacations, hobbies or volunteering. Many also struggle with balancing their work schedules around caregiving responsibilities. Tasks such as calling doctors, scheduling appointments and providing transportation need to be done during daytime hours. When you are working, it can be difficult to take on those tasks without taking time off work or rearranging your schedule. Depression: One of the challenges facing many caregivers is depression. It’s not unusual to develop some sort of depression because of the constant demands while providing care. Additionally, many caregivers don’t maintain an active social life and they lose touch with others outside of the home. They can begin to feel disconnected from their friends and family. What makes it even more difficult is that most people don’t recognize the signs of depression within themselves, and they are embarrassed to admit how they are feeling. Finding the right family caregiver support group could be a great comfort. Financial burden: Because most family caregivers are unpaid, they can experience some financial strain, especially when their duties take them away from a paying job. Some also spend much of their own money on expenses such as transportation, living accommodations and food, as well as on medication, services and other treatments for their loved one. Not asking for help: I’m fine… I don’t need any help… I can do it all! Does this sound familiar? Many primary caregivers take on full-time responsibilities without asking for assistance from others, even if they have other family members close by and available to help. This can lead to worry and guilt, wondering if they are providing the best care possible, not to mention stress, burnout and potential health problems. Services such as respite care can be so important as it allows caregivers to take a break so that they can focus on themselves for a while. If you are a primary caregiver, it is imperative that you find a balance between caregiving and your own life. Not paying attention to your personal needs and happiness can create resentment over time as you continue to put others’ priorities ahead of your own. Are you a primary caregiver? What are some of the challenges you face as you take care of your loved one? Comment on this post or head over to our Facebook page to join the conversation.